I’m afraid, there’s not been much blooming in the garden this month to provide us with perfume. There’s the last of the lavender. 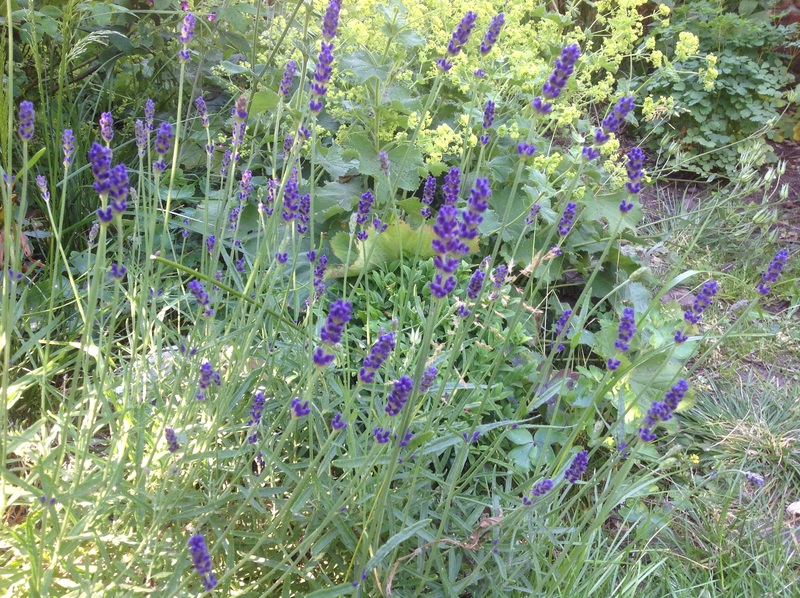 These lavenders, “Hidcote”, were planted earlier in the summer, in the sunny front garden. They’re settling in well and flowering nicely already. I love the dark purple flowers. They should be completed well by the paler Perovskia planted behind. The beauty of these two plants, is that they don’t need to flower to provide perfume. Like the lavender, Perovskia, too, has aromatic leaves. And, of course, flowers don’t have the monopoly on scent. 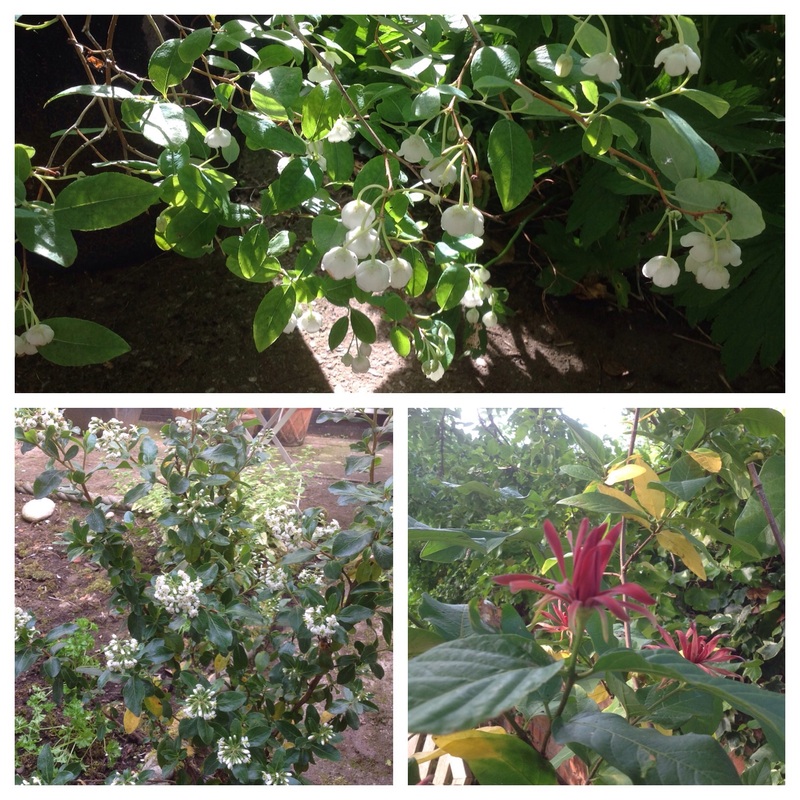 So many plants have scented, aromatic leaves and they provide the backbone to the scented garden. We all know the Mediterranean herbs well – Rosemary, sage, thyme and so on. Every well stocked garden should have these stalwarts, whether as decorative specimens, (just think of purple sage in a border!) or a as a dedicated herb garden. Brushing against the leaves gives a whiff of sunny climes! At this time, when flowers are becoming more scarce, leaves are there to plug the gap. Apart from the obvious lavenders and herbs already mentioned, we have several other interesting plants who give us scent through their leaves. The Caryopteris, which has just stopped flowering, still has, for the moment, its aromatic foliage. Choisya ternata, Drymis and Calycarpa are other shrubs that have scented leaves when rubbed. Did you know that, when crushed, Gaultheria procumbens (I know! It too, has had a name change! I think it’s now Pernettyia!) 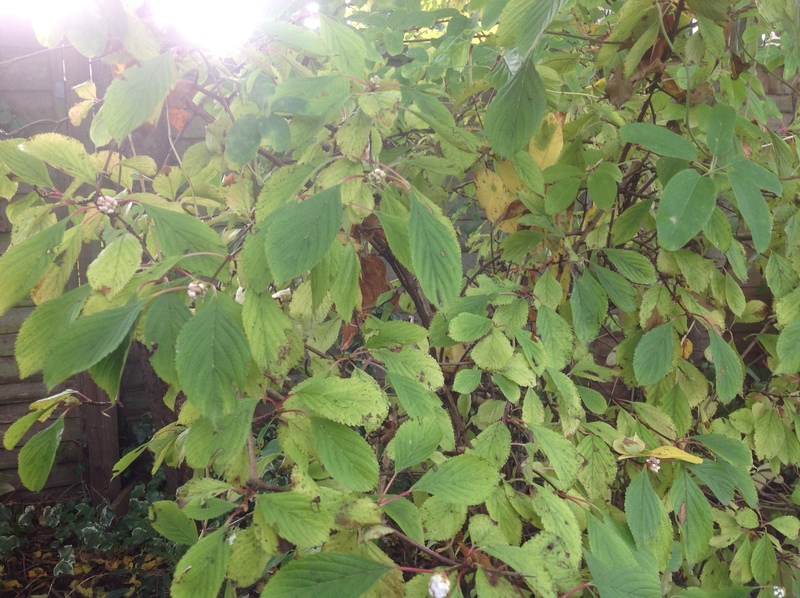 leaves smell of germolene? And that, when wet, the leaves of Rosa rubiginosa, the sweet briar rose, smells of apples? Oh, and there’s Cestrum parqui, but that’s not pleasant! So all is not lost! Autumn is all about foliage, mainly due to its myriad of colours. 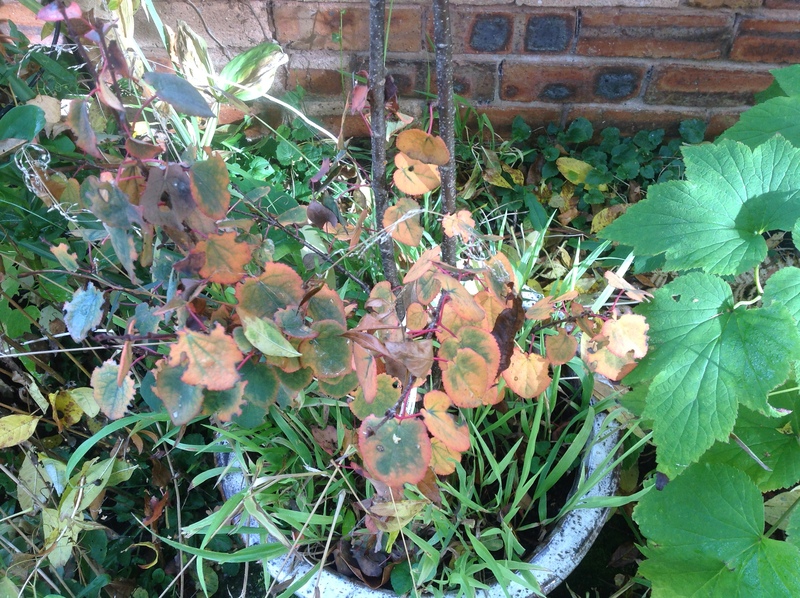 This is Cercidiphyllum japonicum “Red Fox”, which have growing in a pot, under planted with the golden grass, Milium effusum, or Bowle’s golden grass, which complements this plants plum coloured foliage. But at this time of year its red leaves become a gorgeous mix of toffee shades. And that’s not all! The fallen leaves smell of candy Floss! But, it has reached the time of year, where the scented flowering shrubs are heading towards their winter display. 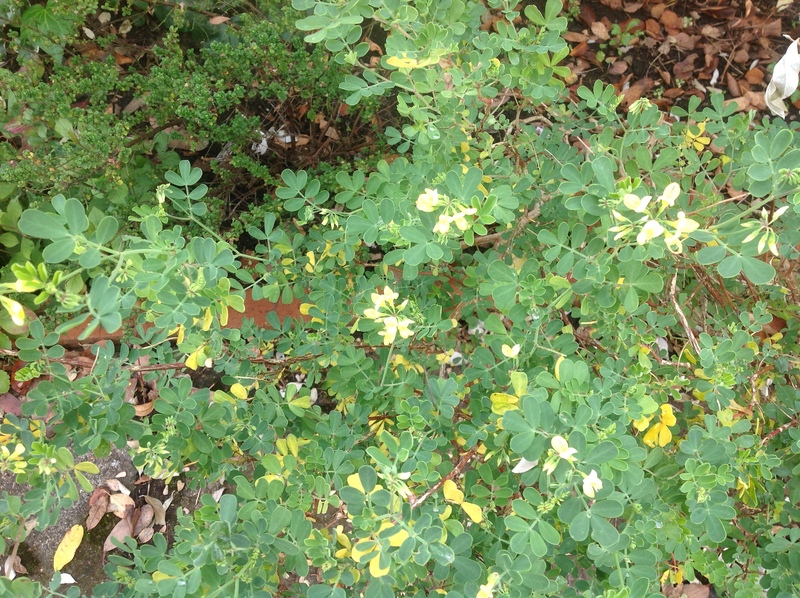 Our wonderful Coronilla “Citrina” has started flowering again. I swear it can only have stopped flowering a couple of months ago! Mahonia japonica’s racemes of lemon, perfumed flowers are just starting to open, and Viburnum farreri has its tiny “cotton wool” balls of pink, flowering too. Yes, summer is definitely gone and it’s all about winter now! How’s your garden smelling this month? Do tell us! And thank you to Wellywoman and Backlane Notebook, for starting this. This entry was posted in The Scented Path and tagged Cercidiphyllum, Coronilla, Foliage, Garden scent, Herbs, Lavender, perovskia, Roses, Scented shrubs, Viburnum on October 31, 2015 by thelonggardenpath. The baton that June laid down, has been most definitely picked up by July, and is now off and running. The July scented garden has all the usual suspects – roses, honeysuckles, sweet peas, lavender, pinks and Jasmine. The camera has gone into overtime and the volume of photos now, necessitates the use of montages, to display them all! 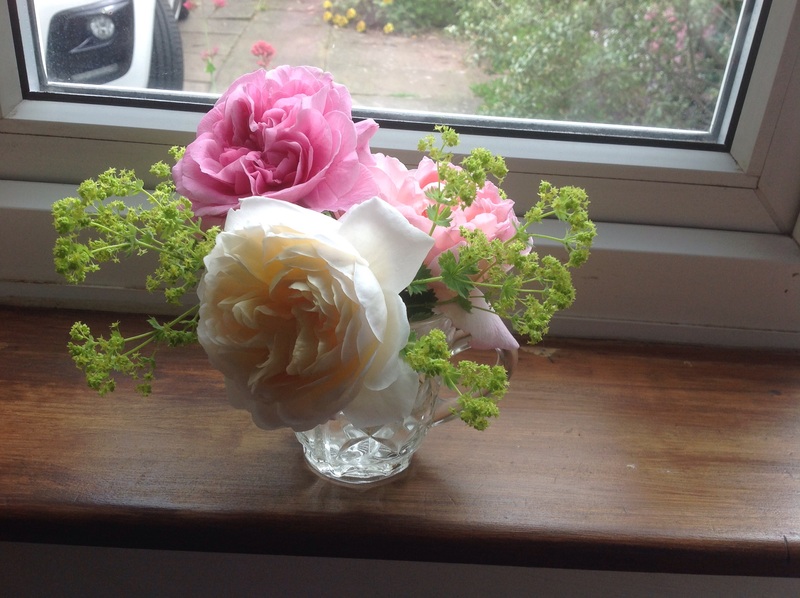 Some of our roses, missed the bus in June, and have now caught the next one. 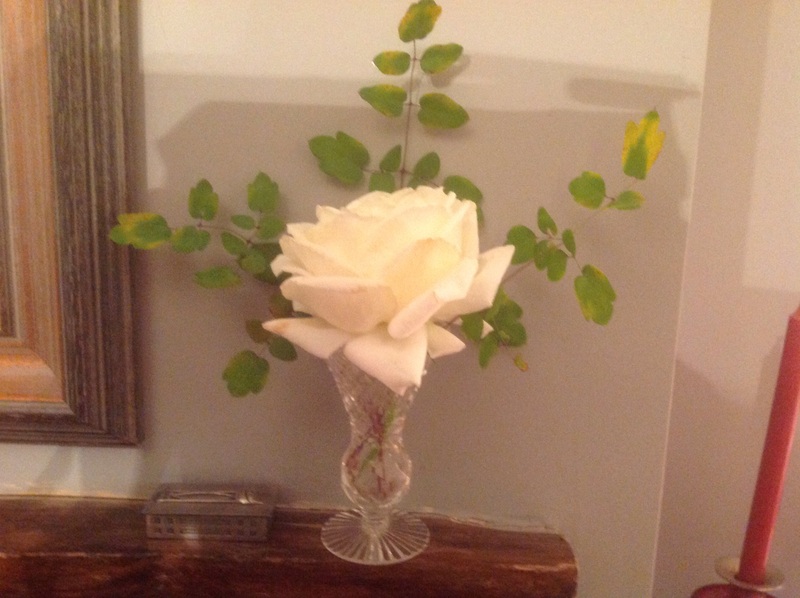 But I still maintain, that Philadelphus most definitely give roses a run for their money when it comes to perfume. 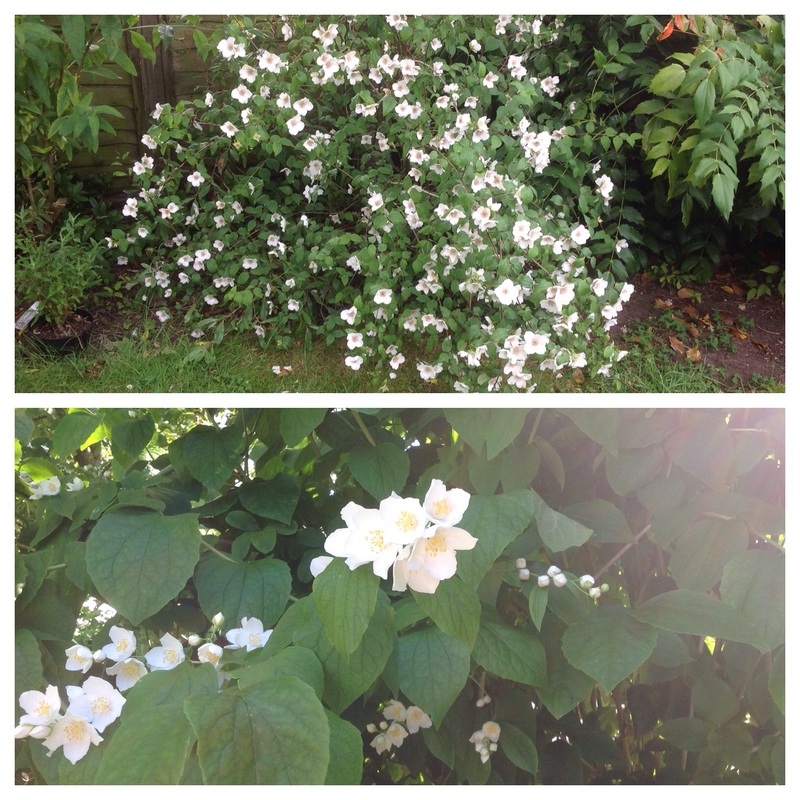 We have two – the giant, clumsy mock orange, rescued from a supermarket shelf, claiming to be “Virginal”, and the smaller, more delicate, “Sybille”. Of the two, “Sybille” has the better perfume, and its bubblegum scent carries all around the garden. For scent in the garden, nothing can beat lavender. 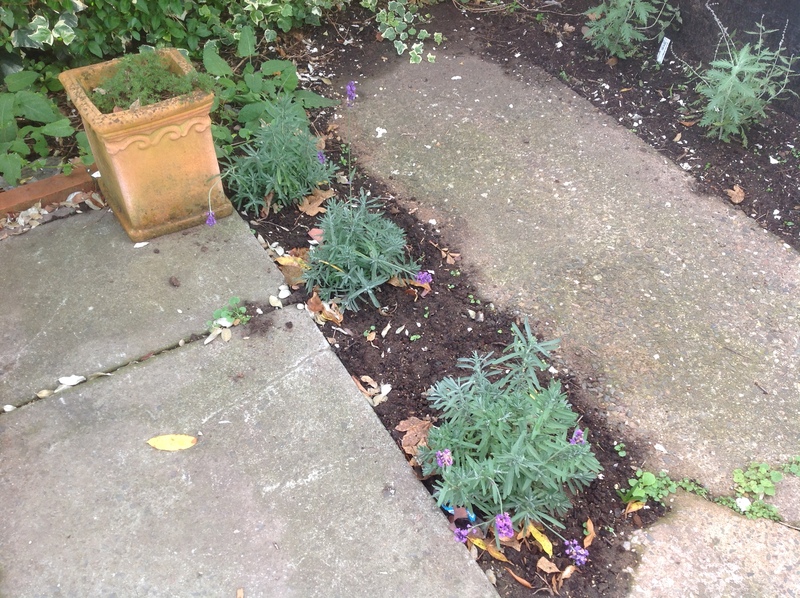 It shouts the Mediterranean – even though L. angustifolia is English lavender! I love it! I grow it wherever I can, in pots, as well as in the borders. In common with other aromatic herbs, it gives us perfume all year round from its leaves – the flowers are a bonus! This lavender, “Hidcote” with its dark purple flowers, looks particularly good alongside the yellow froth of Alchemilla Mollis. 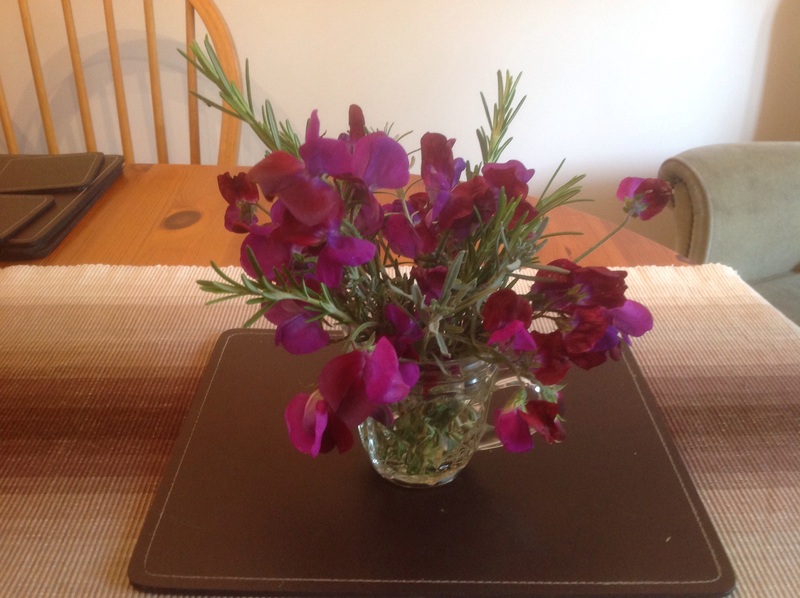 Other aromatic herbs are adding to their appeal by starting to give us flowers, as well. 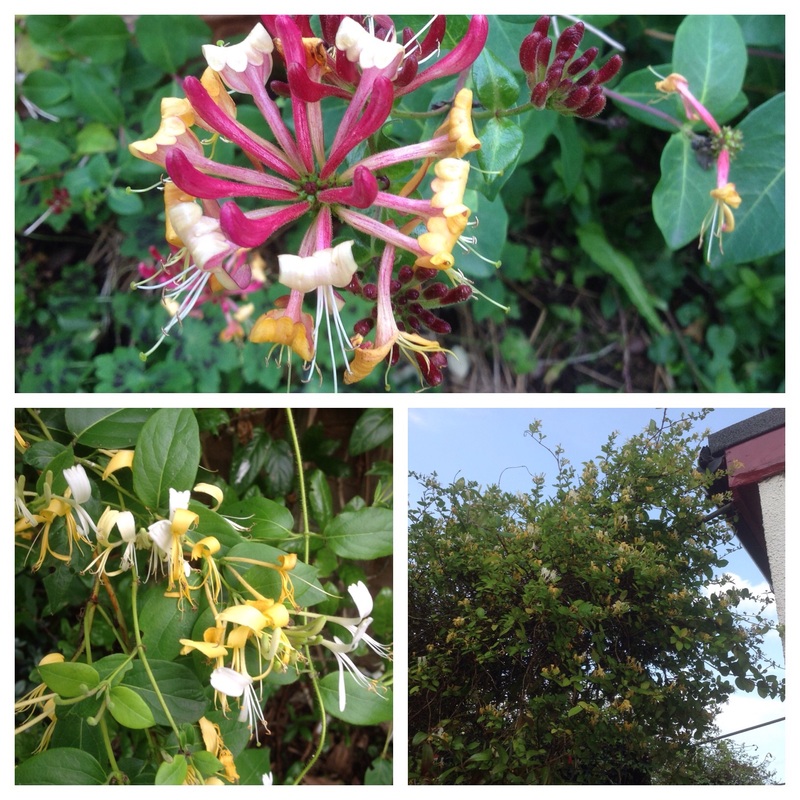 Our Honeysuckle “Belgica” is still going great guns, and has been joined with a few pals …. 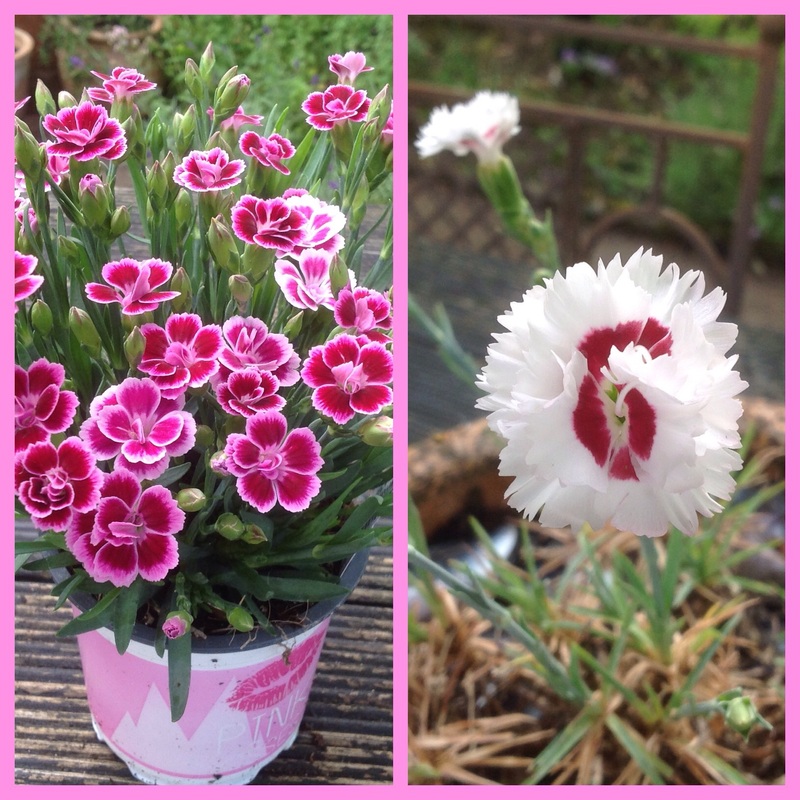 My potted pinks are giving me particular pleasure on the patio. I do have a few other more unusual gems, though. More on those another time! Now, I must show you an idea I “borrowed” from the local pub! 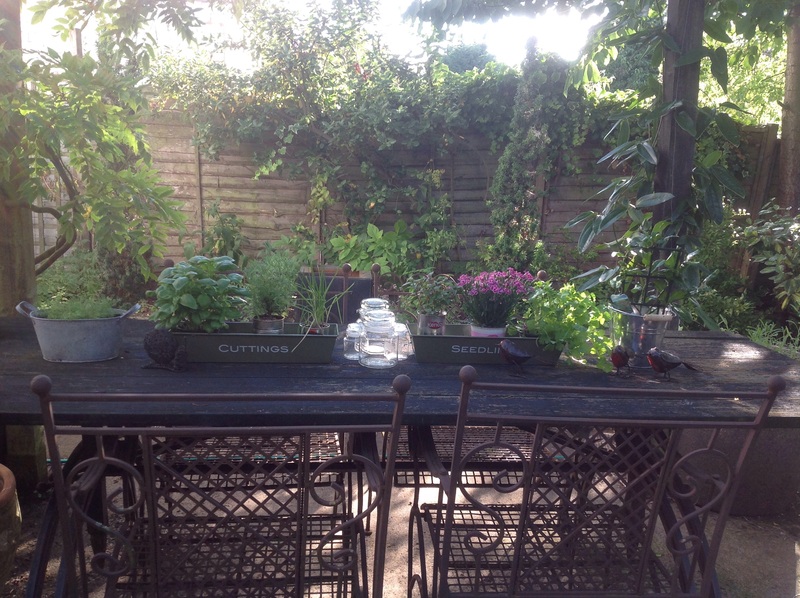 They had pots of herbs and flowers in a small trough on a table in the garden. It got me thinking of a line of troughs along our outdoor dining table containing scented flowers, and herbs for picking and adding to food. What do you think? Add some jars for tea lights, a pot of “touchy-feely” chamomile and our recently acquired Kaffir lime, and that’s a lovely table centre piece. 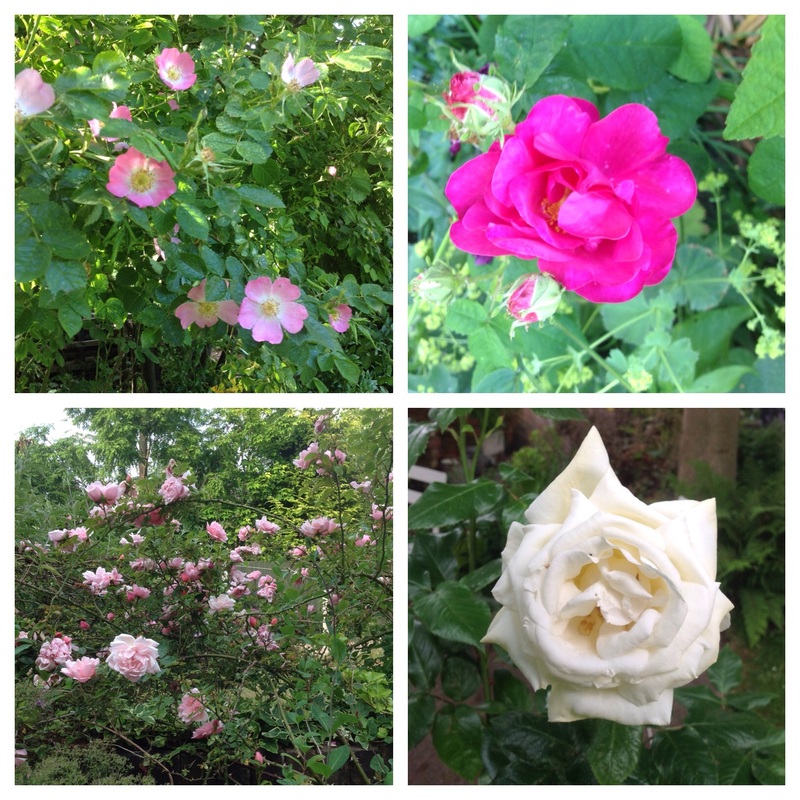 July’s scent, though, has not been restricted to the garden. Some of it found its way indoors. 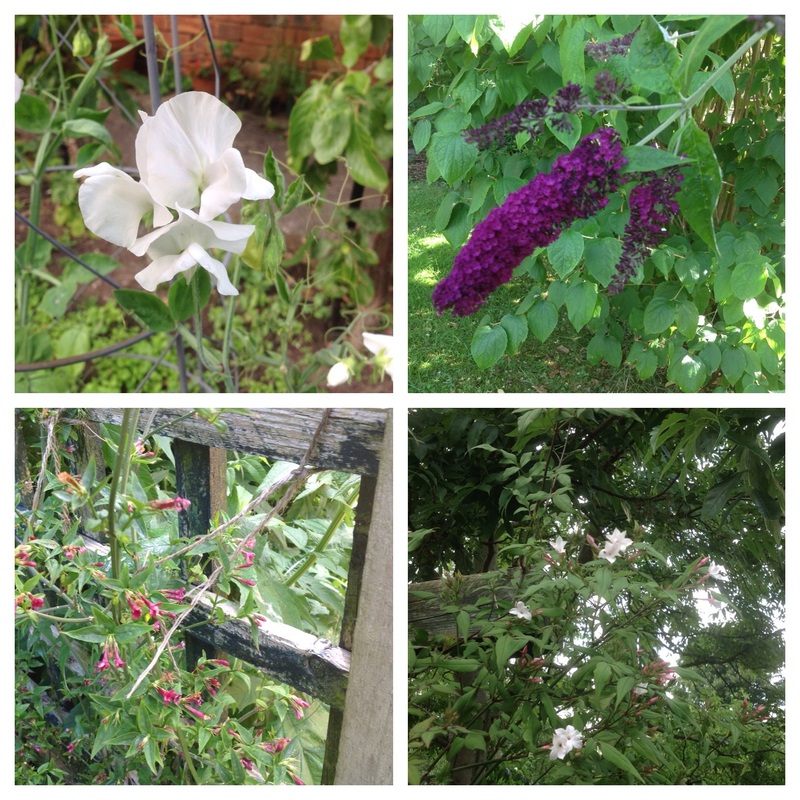 This entry was posted in The Scented Path and tagged Calycanthus, Escallonia, Herbs, honeysuckle, Jasmine, Lavender, Philadelphus, pinks, Roses, Zenobia on July 25, 2015 by thelonggardenpath. This was my favourite for the month. 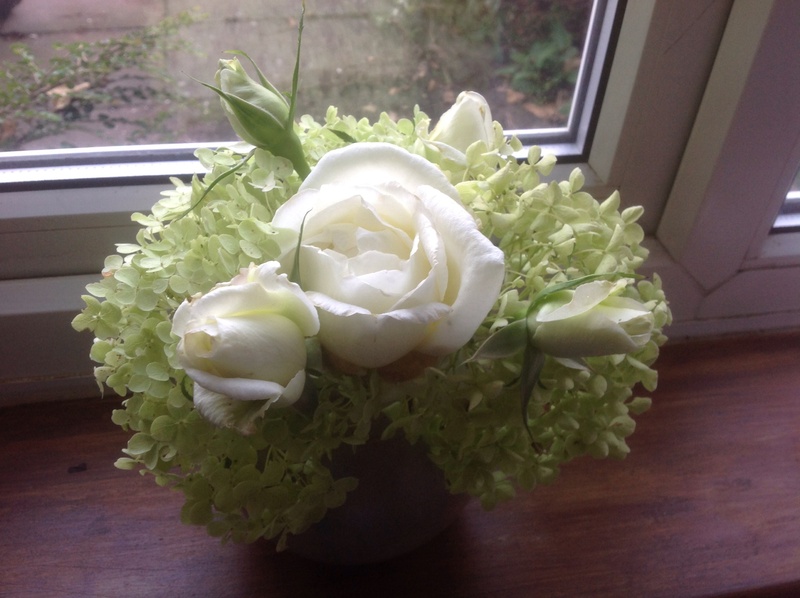 I loved its freshness, and was enjoying the late burst of pure white rosebuds, nestled amongst the lime green flower heads of our good old friend “Annabelle”, yet again. 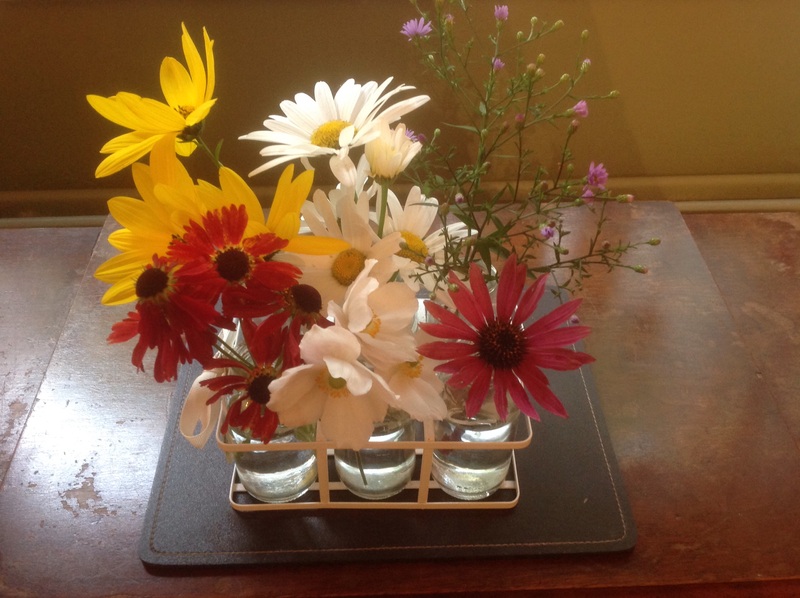 And it was also, my first foray into Cathy’s meme “In a Vase on Monday”. Mind you, it was a close run thing! 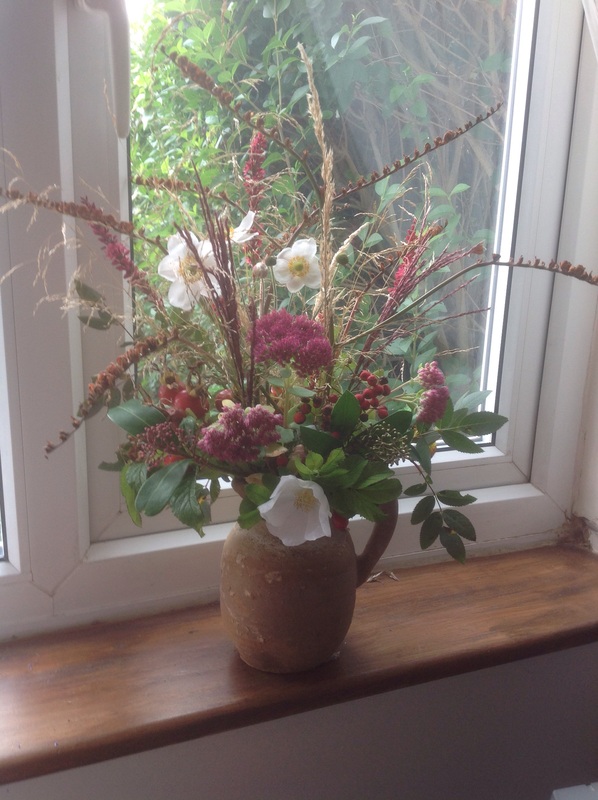 Roaring into second place, was my warm, rosy wine vase I created for my “Last of the Summer Wine” post, out of the dying embers of the garden. It was quite a concoction of wine coloured flowers, buds and grasses, seed heads and red berries, freshened up with some simple white Anemone “Honorine Jobert” and Rosa rugosa flowers. The wine tones were provided by the flowers of our unknown Sedum, Persicaria amplexicaulis “Firetail”, the buds of Skimmia rubella, and the wonderful, velvety flower spikes of Miscanthus “Ferner Osten”. Other grasses were also used in the making of this vase. Seed heads were provided courtesy of Crocosmia “Lucifer”. 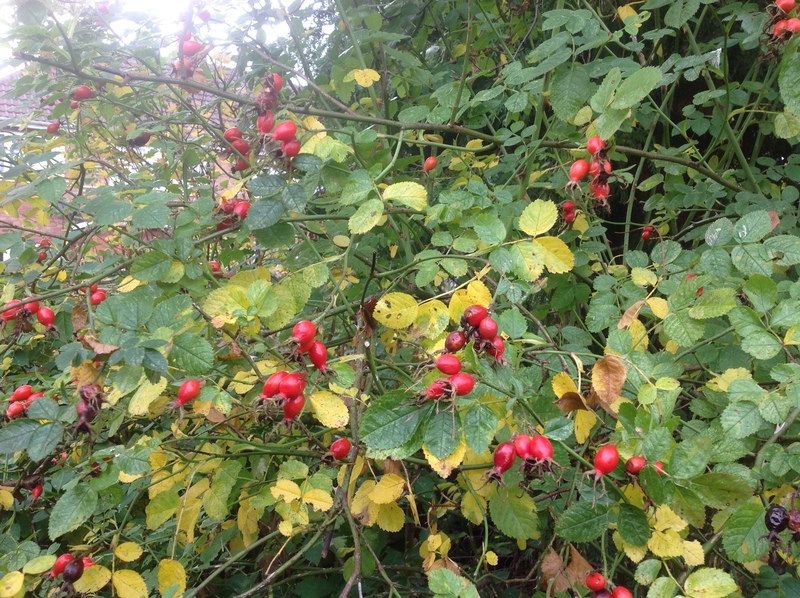 The red berries used were from our Rowan tree (again, unknown variety) along with the hips of two roses – the fat juicy ones of Rosa rugosa and the smaller, goblet shaped ones of Rosa rubiginosa – complete with their leaves to provide bright green and blue green foliage respectively. Quite an autumnal display! I must share with you my landmark of earlier in the month. 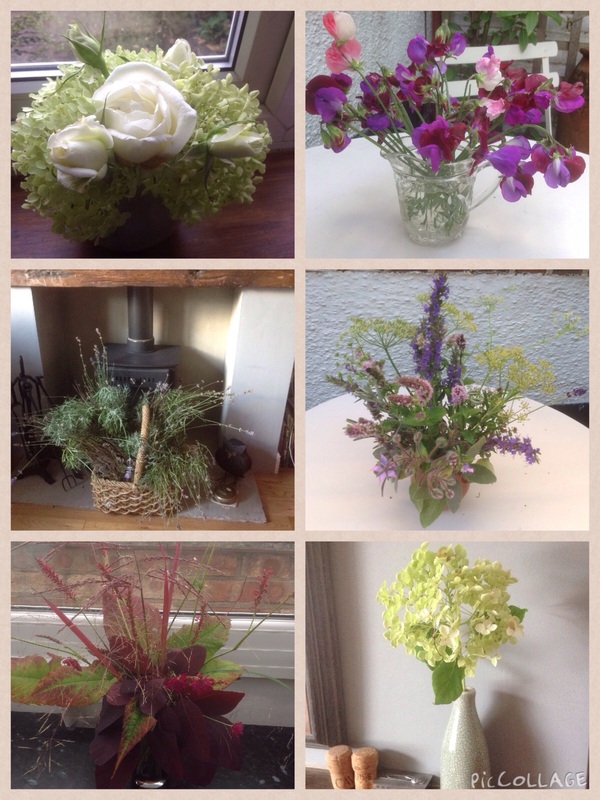 Six vases in one day! You probably recognise several of them carried over from August, but there’s a couple of fresh ones, in there. 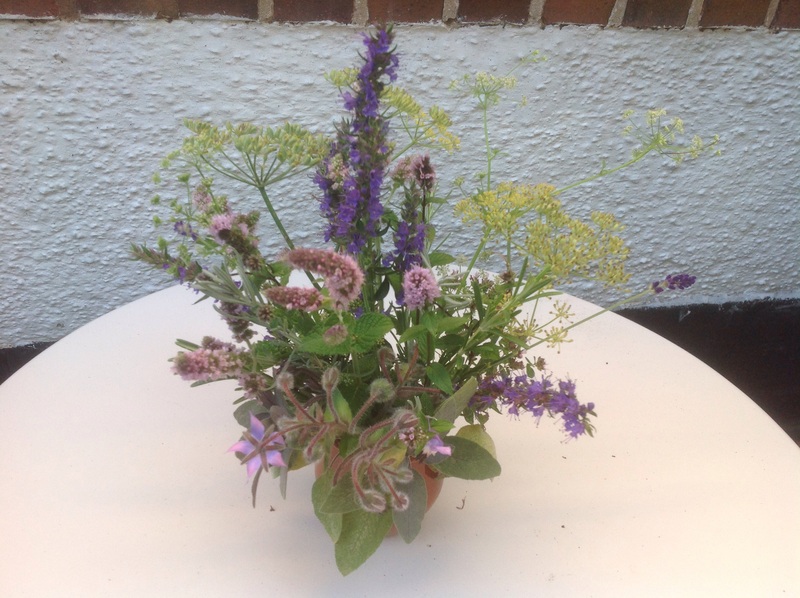 with mint, lavender, hyssop, fennel, borage and purple sage. 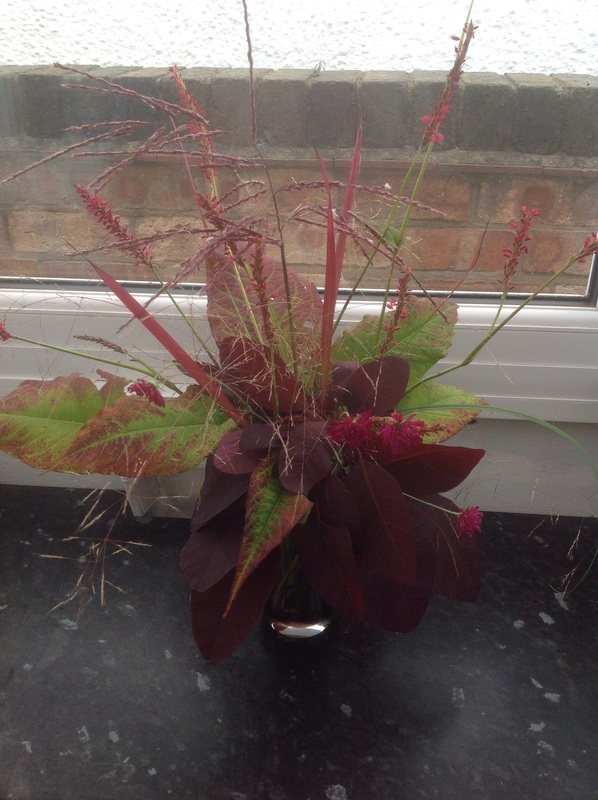 with Persicaria used again, this time complete with leaves, complemented with the favourite wine combo of Cotinus “Grace”, and Miscanthus “Ferner Osten”. You can also see the red blades of the grass Imperata rubra, blending beautifully. 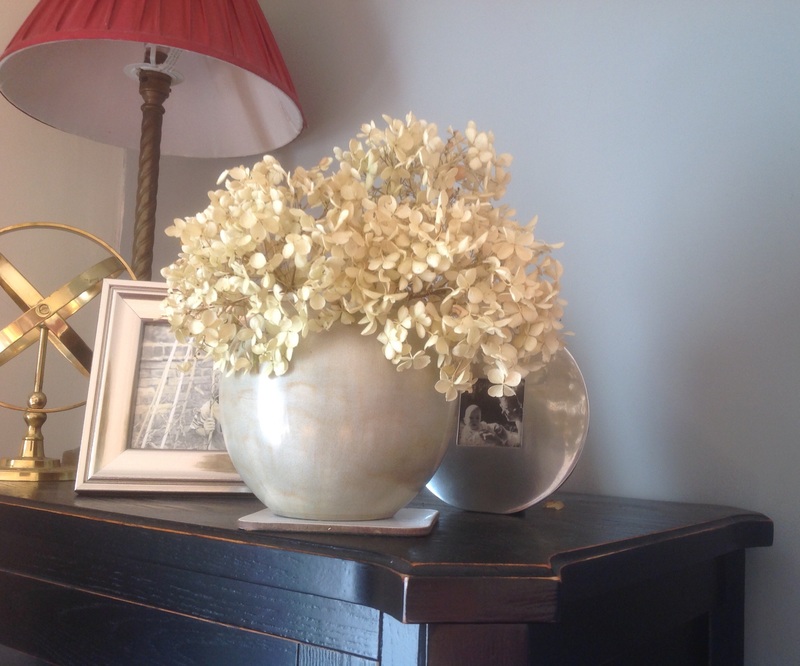 the same vase, minus the long gone roses, fading away like a sepia photo! 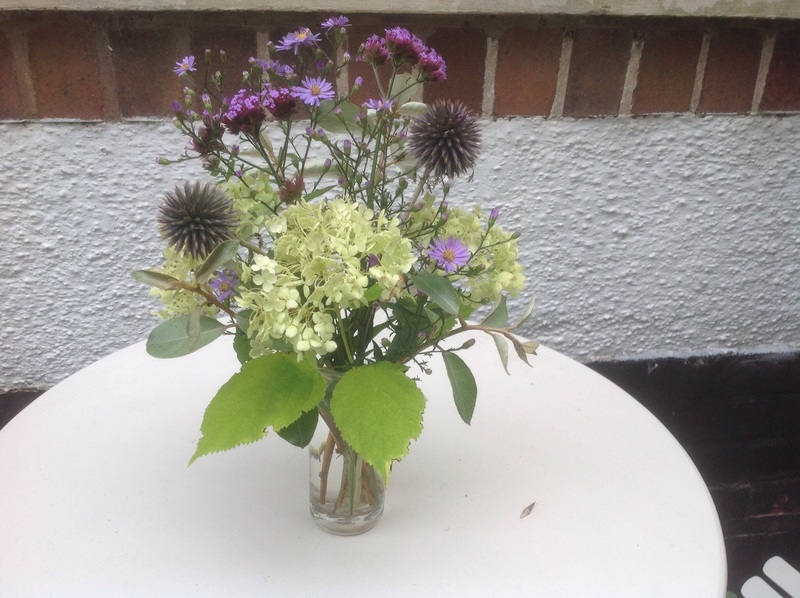 This entry was posted in The Cuttings Calender and tagged Berries, cut flowers, grasses, Herbs, Hydrangea "Annabelle", Milk bottles, Roses on October 10, 2014 by thelonggardenpath. …..came back with mundane necessities. Compost, slug pellets (organic, of course!) and liquid seaweed, all had be got. Yawn! But it would be unforgivable not to browse while there! So into the basket went a few other “living” necessities. Herbs. Our sunny herb border, was needing to be padded out a bit. When I say border, in reality it’s an edging of herbs, along one of our veg. beds. 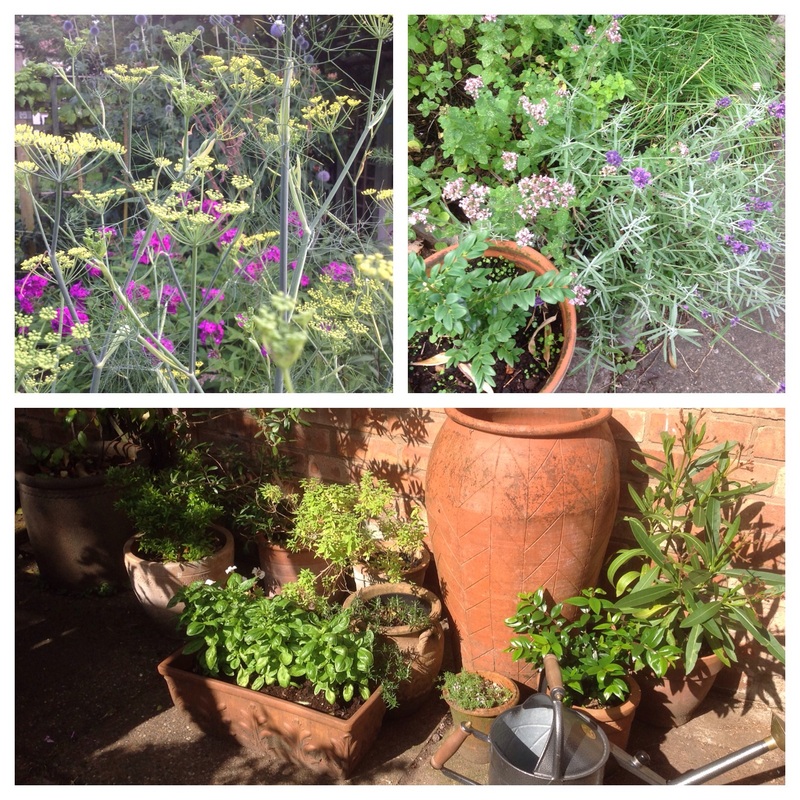 Our herb garden proper, is a tad on the shady side, and while the leafy herbs – oregano, chives, parsley etc.- do well, the woody, Mediterranean herbs prefer the sunny position in the “allotment”. 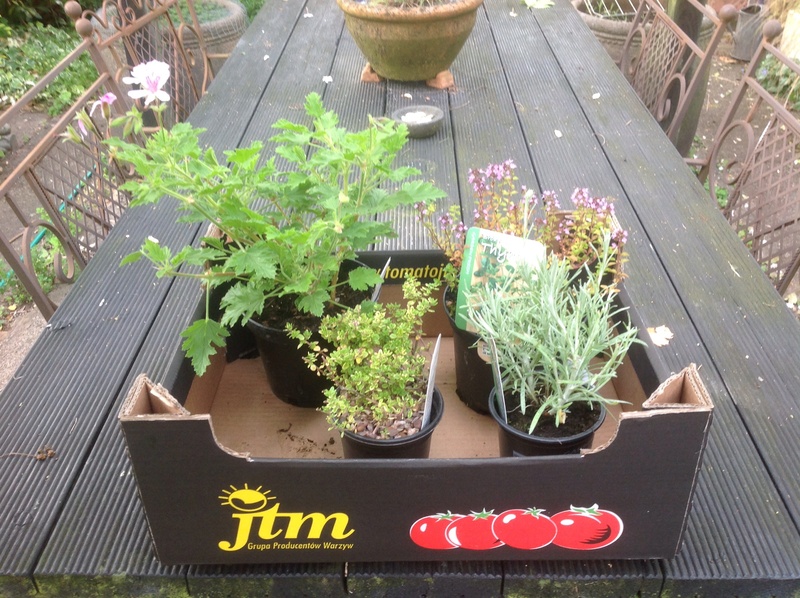 The choice was a bit narrow at this time of year, but they did have what I was looking for – two thymes, one broadleaf, the other “Golden Queen” which is a lemon-scented thyme, and a curry plant. I love the smell it gives off, when it’s hot. And a scented-leaf pelargonium. I had an empty terracotta pot that was itching to be filled, and was the right size for a pelargonium. My “collection” has now dwindled down to one, and I was keen to get another. This one is P. citriodorum, obviously a lemon- scented geranium. Just coming into flower, too! All in all, a weekend full of foody smells! This entry was posted in I went to Ashwood and... and tagged Herbs, Scented leaf pelargoniums on July 14, 2014 by thelonggardenpath.